“Where have you been?" she cried. "Damn you, where have you been?" She took a few steps toward Schmendrick, but she was looking beyond him, at the unicorn. When she tried to get by, the magician stood in her way. "You don't talk like that," he told her, still uncertain that Molly had recognized the unicorn. "Don't you know how to behave, woman? You don't curtsy, either." But Molly pushed him aside and went up to the unicorn, scolding her as though she were a strayed milk cow. "Where have you been?" Before the whiteness and the shining horn, Molly shrank to a shrilling beetle, but this time it was the unicorn's old dark eyes that looked down. "I am here now," she said at last. Molly laughed with her lips flat. "And what good is it to me that you're here now? Where where you twenty years ago, ten years ago? How dare you, how dare you come to me now, when I am this?" With a flap of her hand she summed herself up: barren face, desert eyes, and yellowing heart. "I wish you had never come. Why did you come now?" The tears began to slide down the sides of her nose. The unicorn made no reply, and Schmendrick said, "She is the last. She is the last unicorn in the world." Here I see a brilliant illustration. Wonderful! 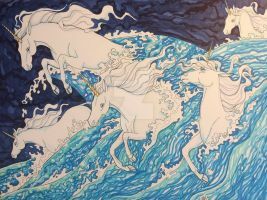 I love The Last Unicorn and Molly Grue I think you're one of the few people (or even the first) I've met who know it!! It is one of the most beautiful and heartbreaking books I've ever read, and your painting of this moment is lovely! Thanks so much!! I'm so happy to meet a fellow Last Unicorn reader... It was my absolute favorite book/movie when I was young and looking back there's so much more to it than I ever knew. It is indeed very sad though! There's a movie?? I must try to find it. TLU was terribly sad for me when I was young. I now see the beauty and love and poetry in it with so much greater clarity, and I realize it wouldn't have been so beautiful if it hadn't been so heartbreaking. Thanks so much I'm pleased with the way it turned out too. Learning to watercolor one painting at a time! Gorgeous, love your color scheme! Thank you I'm still trying to work on varying up my value range. This is so lovely. 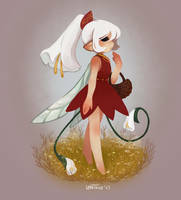 I adore your version of Molly and The Last Unicorn! By the way, "Schmendrick", if I got that right, it's the unicorn's name. Which means "fatty boy" in Hebrew. Thanks!! You just made my day. I had no idea about the Hebrew thing- that's so funny. "Schmendrick" is the wizard's name; the unicorn takes the name "Amalthea" when she becomes a woman. Which is the name of the goat that Zeus nursed from? I think? beautiful! excellent depth and great mood, lovely colors!